Ms Lee was born in Malaysia. She began her journey in music since her young age which then she proceed in earning her Bachelor degree in Music Performance (Piano and Cello) and Music Technology in University of Putra Malaysia. During her years in college, she was actively involved in several performances with outstanding musicians. In year 2009, she continued her study in Master of Music in Piano Pedagogy in West Virginia University, under the tutelage of Dr. Peter Amstutz. 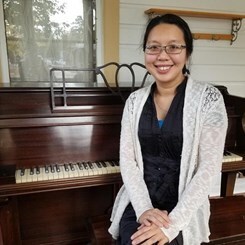 Ms Lee began teaching piano since she is graduated from her high school. She has a special thing with children and she is very patient with them. The age of her students ranged from 4 years old to 70 years old. She has extensive experience in the ABRSM piano examination. Ms Lee believes that music is the powerful universal language. It is unbreakable for our daily life. Therefore, every student has their uniqueness and potential in music. She hopes that her student will learn music through an enjoyable, fun and progressive journey. Request Lessons with Pei-yee Lee today!